Sherefe – Only opportunity to see us until late summer! Sherefe Balkan/Middle Eastern Band quintet plays for Dining, Dancing, and Listening Pleasure. 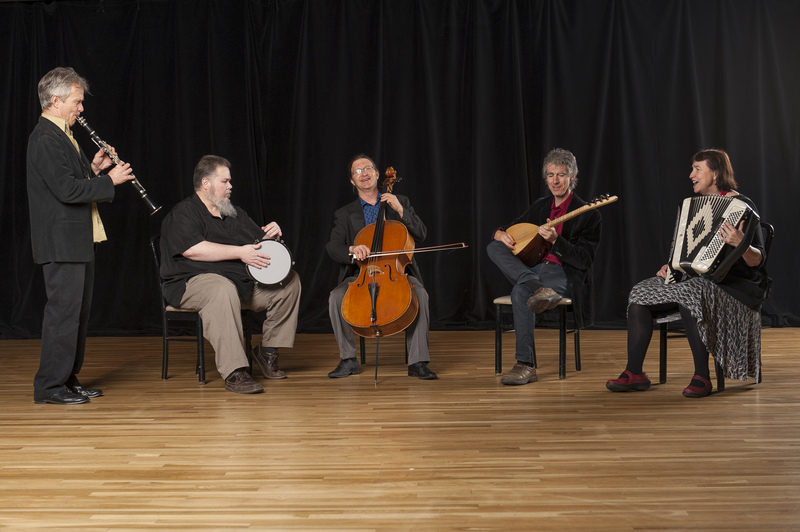 Sherefe is a group of musicians based in Boulder, CO, who play music from the Balkans and the Middle East. An ensemble varying in size from a trio to a small orchestra, they have been performing at concerts and dance parties in the western US since 1996. Sherefe (named after a Turkish drinking toast “to your honor” ) dearly loves this music and devotes significant time and energy to it. The repertoire consists of large numbers of Greek, Turkish and Arabic songs, as well as smaller numbers of Bulgarian, Macedonian, Bosnian, Rom, Albanian, Hebrew, Persian and Armenian pieces. Sherefe plays mixed repertoire shows, but also frequently plays entire evenings of songs from just one of the cultures mentioned for weddings, festivals, etc. Members performing this show are Jesse Manno on bouzouki, baglama, ud, lauoto, vocals, and percussion, James Hoskins on cello, gadulka, bouzouki, and vocals, Julie Lancaster on accordian and vocals, Dexter Payne on clarinet, baritone sax, and nay, and Brett Bowen on doumbeks, frame drums, and tapan.